The first sustained analysis examining legal transplantation into East Asia, this volume examines the prospects for transplanting a 'rule of law' that will attract and sustain international trade and investment in this economically dynamic region. 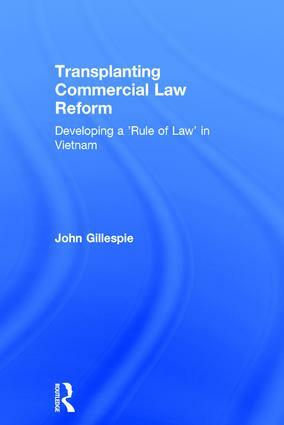 The book develops both a general model that explains how legal transplantation shapes legal development in the region, whilst developing theoretical insights into the political, economic and legal discourses guiding commercial law reforms in Vietnam. For the first time, this book develops a research methodology specifically designed to investigate law reform in developing East Asia. In so doing, it challenges the relevance of conventional convergence and divergence explanations for legal transplantation that have been developed in European and North American contexts. As the first finely-grained analysis of legal development in Vietnam, the book will be invaluable to academics and researchers working in this area. It will also be of interest to those involved in commercial legal theory. Contents: Introduction - law reform by legal transplantation; Developing a legal transplantation theory; A brief history of legal transplantation into Vietnam; Transforming socialist legal ideology; Party leadership: the separation of party and state; Discursive and strategic lawmaking; Implementing imported laws; Non-state pressure groups and legal borrowing; The rule of law and Vietnamese relational transactions; Conclusion; Bibliography; Index. Dr John Gillespie is Professor at the Department of Business Law and Taxation, Faculty of Business and Economics, Monash University, Melbourne, Australia. He teaches, researches and writes about law and development and legal change in East Asia. John has consulted widely with international donor agencies in law and development projects in Vietnam, Indonesia and Laos. Prior to entering academic life he worked as an attorney in an international law firm.